Mimaki's new Tx300P-1800B textile printer with fabric transportation belt is ideal for producing samples, short production runs and custom orders, even on thick, sheer and elastic textiles. Mimaki's new Tx300P-1800B features a fabric transportation belt to aid feeding material during the print process. 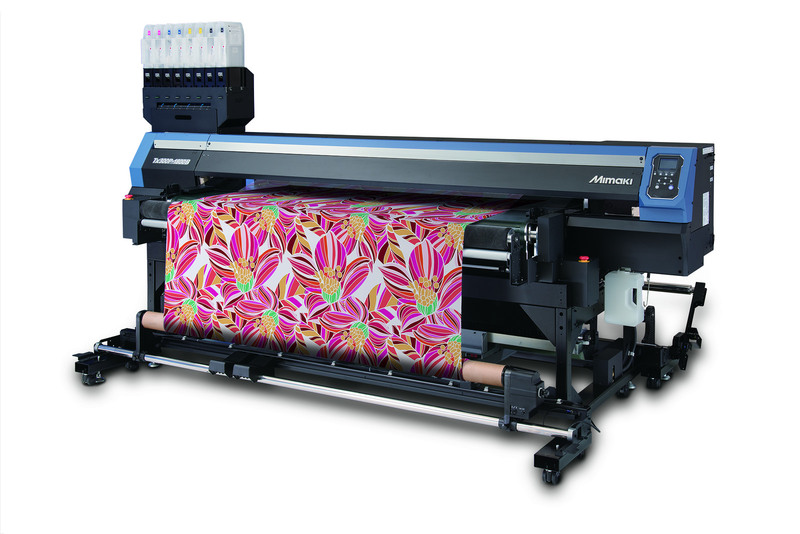 Mimaki has announced the launch of a brand-new textile printer; the Tx300P-1800B (Belt). The 1.8 metre wide printer is specifically designed to address the need in the textile and apparel industries for cost-effective, short run printing of textiles for products or samples. Its unique design makes it ideally suited to printing on a wide variety of fabrics, including bulky textured materials, as well as sheer fabric and stretchy materials such as knits. It also eliminates the need for steaming or washing when printing with Mimaki TP400 textile pigment inks, thereby reducing the space required for on-demand textile printing. Mimaki believes that the significant upturn in online shopping brings with it a growing demand for the creation of custom products, with customers moving their attention away from standard designs widely available in retail outlets. Accordingly, enterprising garment makers are looking for cost-effective solutions that will help them meet the demand for sample production, short runs and bespoke prints. The new Mimaki Tx300P-1800B belt-type printer has been specifically developed to meet these needs, as well as having the flexibility to print to an even wider range of different fabrics than ever before with a comprehensive range of ink set options. In order to accommodate the wide range of potential applications, Mimaki will be offering five different ink types with the Tx300P-1800B. These include; Sb420 Sublimation Dye Ink designed to work perfectly with polyester-based textiles, either direct to fabric or to a sublimation paper for transfer by heat press, which feature a broad colour gamut including a deep and powerful black; Dd400 Dispersion Dye Ink delivering high light-fastness and outstanding build-up on polyester and micro-polyester for sportswear, curtains, outdoor textiles, home textiles and the auto industry and TP400 Textile Pigment Ink; probably the most flexible of all the Mimaki textile inks, with its ability to print to a wide variety of textile types such as polyester, cotton, silk, viscose, rayon and wool. This ink also removes the need for steaming or washing, thus reducing time, cost and potential water pollution. However, a binder or primer is recommended to achieve the quality that both manufacturers and consumers demand. Also available will be Mimaki’s Rc400 Reactive Dye Ink, suitable for printing on natural fibres, such as cotton, silk and wool. It also meets high automotive light-fastness standards but does require pre- / post-treatment of the fabrics to prevent fading and bleeding of colour. The results are sharp images and rich, deep colours. The final ink option is Mimaki's Ac400 Acid Dye Ink which is similar to Reactive Dye Ink in that pre- / post-treatment of the fabric is needed. These inks produce bright, deep colours in the complete gamut of shades required by the fashion and apparel industry as well as good light- and wet-fastness. The new Mimaki Tx300P-1800B will be exclusively distributed in the UK and Ireland by Hybrid Services Ltd and the company’s National Sales Manager - Textile & Apparel, Stephen Woodall comments, “This is a very exciting development for the textile and apparel printing industry, bringing speed, quality and flexibility to the market at a very accessible price." "The Tx300P-1800B really does bring game-changing technical innovation in textile print within the reach of many more garment makers and manufacturers. The printer's belt media transport system flattens the textile and makes it possible to print easily on textiles that stretch." The new Mimaki Tx300P-1800B has been developed to deliver all the capabilities of the next generation of textile printers at an attractive price point with a host of new technical innovations. The new machine is capable of printing at up to 50 square metres per hour, and can also achieve print resolutions of up to 1,440dpi. The adjustable high head gap prevents head strikes and enables high quality printing on thick, woven or fabrics with ‘raised’ fibres. The potential for crumpling and bending of fabrics during the print process is further reduced by the belt conveyance system which incorporates a “crumple-free roller” and “paste roller” to ensure beautiful, stable print results. The waveform control function allows each ink to be jetted according to its own specific gravity and viscosity, for precise placement of ink droplets onto the fabric. Reliable, uninterrupted continuous operation is catered for by the inclusion of a Nozzle Control Unit to automatically detect and recover clogged nozzles with reduced wastage and the machine also uses two-litre ink packs which further support continuous printing, with reduced operating costs. The new Tx300P-1800B will be demonstrated for the first time at Viscom Italia in Milan from 13th – 15th October and more details about Mimaki products, including its full range of printers and inks can be found at www.hybridservices.co.uk.